Since last time where I started using Angular.js with Angular resources and services, I have been reading a bit and I decided on a little bit different approach. 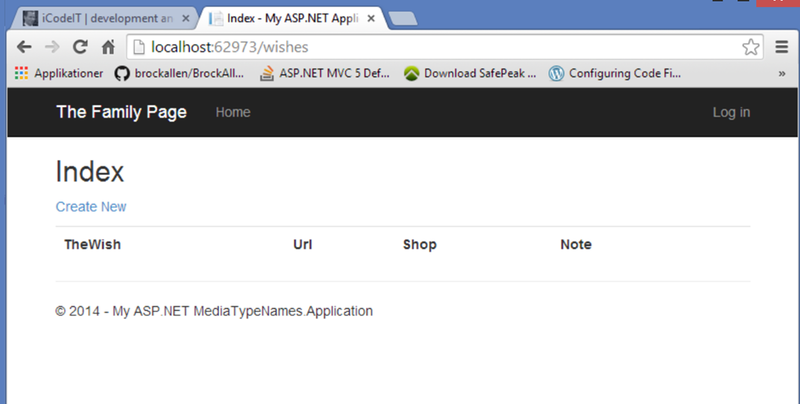 I want to use WebApi on the backend, and Angular factories and controllers. With my current (limited) knowledge of angular, the extra layer of abstraction using a resource makes things a little more difficult to understand without really giving any benefits. This might change later in the process, but right now this is the way I am going. What I am showing here is strongly inspired by Dan Wahlin’s post on the subject. Using an angularjs factory to interact with a restful service. 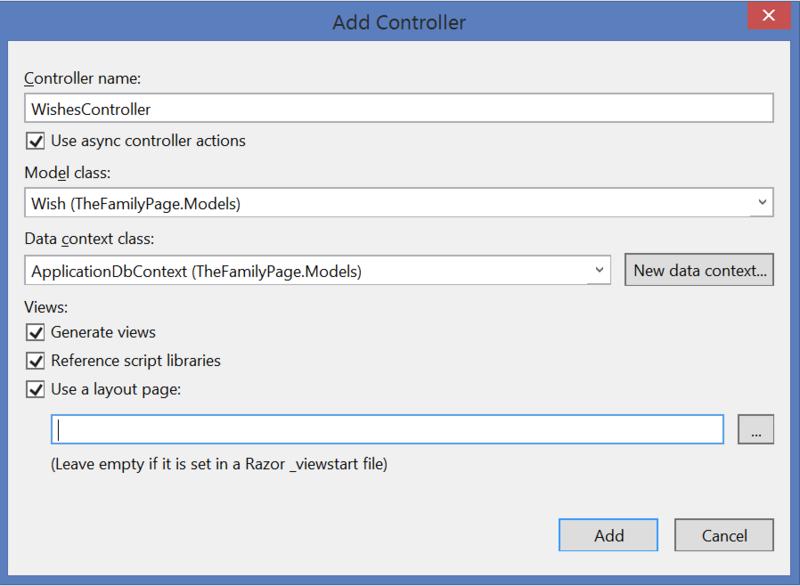 Use controller and factory in Angular.js to get the data from the WebApi controller. Update the view view and data structure a little bit in order to group wishes by user. (instead of just having a flat list). Setting up Angular factory and controller. Now it is time to setup up the angular factory and controller. As mentioned before I find this much easier to work with at the moment, instead of using Services and Resources. Feel free to disagree. You will notice that the controller calls getWishes() in order to initialize $scope.wishes. So everything is working nicely. This time I simply reimplemented what we did last time but I added WebApi and used controller and factory in angular to get the job done. Next time I will add full CRUD functionality. Last time we made the wishlist datamodel, view and controller. Now we will start to use angular.js to show our data. First I create some data to show – this is done the Seed() method of the migrations Configuration class. I have created a family “Dad”, “Mom”, “Son” ,”Daughter” and given each a few wishes. “Dad” has the role “Admin”, while “Mom” has the role “Editor”. The kids are normal users. This is lists all the wishes but we can not see who wishes for what, and the code is not very pretty. I will try to make it a little better by using angular.js. To really understand the module, factory and reosurce stuff going on here, you can read this very good article at dotnetcurry. ng-app in the outer div-tag defines the area of html code where the ngWishApp is active. Further we indicate that we are using the wishController. I then create a list of wishes using the ng-repeat keyword. There is no doubt that this can be more pretty, but right now I am satisfied that I have started to use angualr.js. 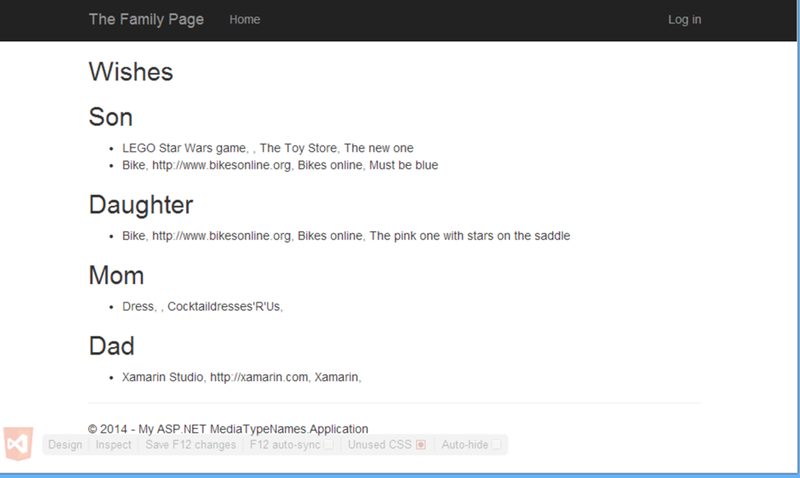 Now that all the user and role code is done, it is time to add some real functionality. This time we will add the data model for the wish list and create a basic controller and view for it. This means that we will not handle anything that relates to connection specific wishes to specifics users today. – A user that has the wish on his/her wish list. 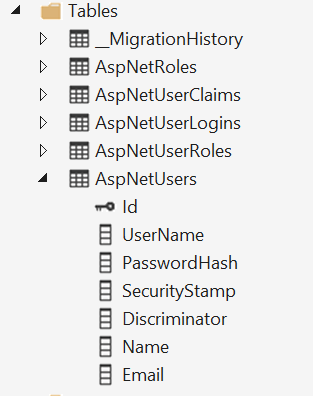 Then we need to add the wishes to the ApplicationDbContext class which is defined in the IdentityModels.cs file. I chose to make the class partial and add a new file called AppilcationDbContext.cs with the parts that is relevant to our data model. The Designer Code for this migration file includes a snapshot of your current Code First model. This snapshot is used to calculate the changes to your model when you scaffold the next migration. 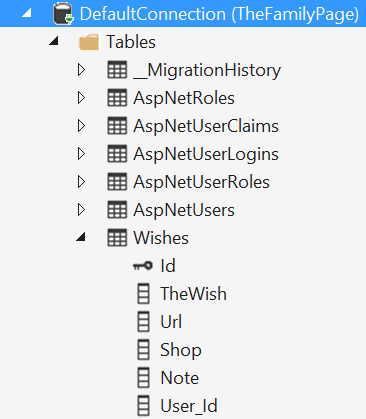 If you make additional changes to your model that you want to include in this migration, then you can re-scaffold it by running 'Add-Migration WishList' again. Now our database is ready for use with the new datastructure. Now a WishesController with all the CRUD actions has been added. Views for these actions have also been added. If we try to run our application we can try to access the wish list, by changing the URL to http://localhost:<port>/wishes – we have to do this manually, since we haven’t added any links to the wish list yet. It is possible to add, edit and remove wishes. We now have the ability to show, create, edit and delete wishes. So the basics of the wish list is in place. Next time I want to implement. Logged in users to be able to edit their own wish lists. Users with the role of editor to be able to edit all wish lists. Links to view wish lists, and links to edit wish lists. This time we will add role management and subsequently give an administrator the ability to a manage (add/edit/delete) users. 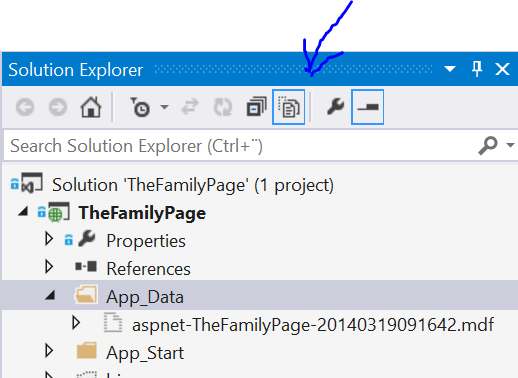 It might seem overkill to have roles on such a simple page, that will hold the content of a family of four. The idea is however that the kids can edit their own content, while mom and dad can edit everything, so roles will be useful. Again it might be overkill to implement management systems for that – we know the number of users and their roles are pretty much set in stone, so we could just hardcode everything. It is however pretty straight forward to implement user and role management and it also has an educational value for me. Create role management CRUD operations in controller and views. Create user management CRUD operations in controller and views. Remove registration from the front page. So this code add the user “admin@admin.com” with the password “Admin@12345” and gives this user the role “Admin”. First we add a simple view model. And a controller for CRUD operations. <p>Deleting this Role will remove all users from this role. It will notdelete the users. All of the above is taken direktly from the Identity sample application. This is NOT code I can take credit for. User management is completely analogue to role management – I will not show the code here, but it is available on GitHub. Next time it is time to talk about content – the wish lists. This will be a short and a bit boring post – it is about cleaning up. Last time we expanded on the IdentyUser Object. I also told that we are not going to use the external log in code (that is the posibility to log in using Facebook, Twitter, Google etc.) 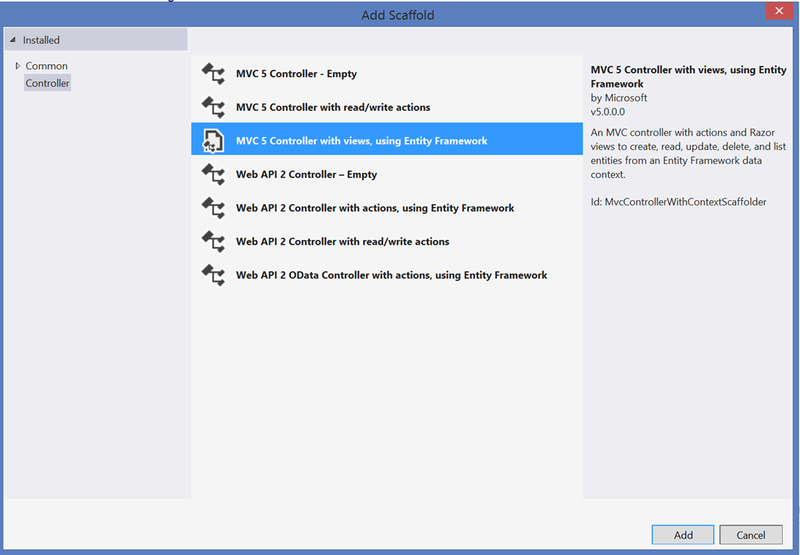 The MVC template contains some code for external log in, even though it is not enabled by default. We are going to remove that code, to give us a more clean code base before we make further modifications to account handling. Remove the field “XsrfKey” that is used by the class “ChallengeResult”. Then remove that class also. If you have done everything right you should be able to build and run the web page without errors. Next time we will look at how to handle forgotten passwords.